Russian foreign minister Sergei Lavrov and US Secretary of State Rex Tillerson head to a meeting in Moscow. A week has passed since US President Donald Trump rained 59 Cruise missiles down on Al Shayrat airfield north of Damascus, in retaliation for the Syrian regime’s use of chemical weapons against its own citizens. But we are not much closer to answering the question: what next? 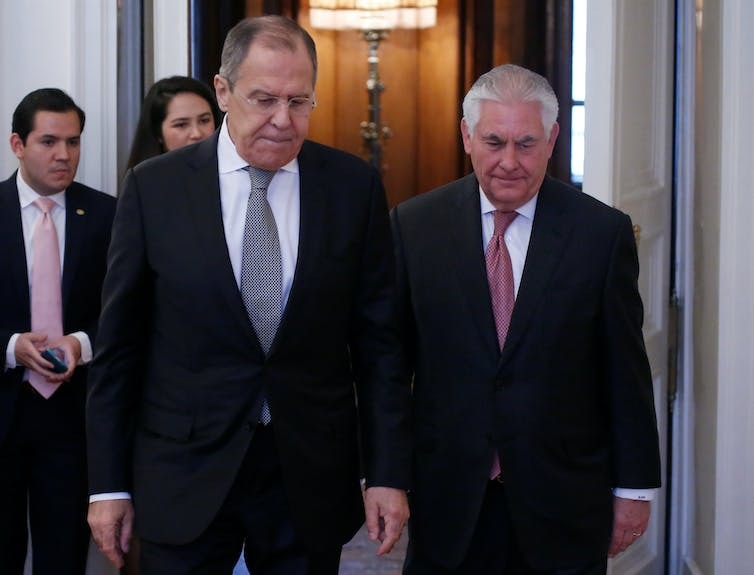 Secretary of State Rex Tillerson’s visit to Moscow late this week hardly answered that question, with the two sides agreeing to disagree – but not necessarily agreeably – on Syria’s responsibility for the chemical weapons attacks. “There is a low level of trust between our two countries,” Tillerson told reporters after meetings with Sergey Lavrov, the Russian Foreign Minister and with President Vladimir Putin. Tillerson also re-stated what had been the position of the Obama administration: a resolution of the Syrian crisis could not involve President Bashar al-Assad. Where all this leaves Australian policy on Syria is unclear beyond a hardening of Canberra’s position on Assad continuing to hold power. Prime Minister Malcolm Turnbull has called for the Syrian leader to go, and indeed face war crimes charges. Turnbull’s liberal interventionist line posed some problems for Foreign Minister Julie Bishop, who has been on the record for several years insisting that Assad should be part of any transition arrangement. Now Bishop says Australia’s position on Assad is “hardening”, thus indicating a shift. If nothing else, she is displaying characteristic nimbleness in bringing herself into line not only with her leader’s position, but that of an evolving American attitude. During Trump’s first 100 days, his administration has been more antagonistic towards the Damascus regime. At last the penny seems to have dropped with the Canberra foreign policy establishment – conspicuously light on for Middle East expertise – that Assad cannot be part of any solution that hopes to bring order to his civil war-ravaged country. In any case, the Syrian pieces may well have moved far beyond being put back together again and we will be looking at best at a sort of Dayton Accords Bosnian solution in which the country becomes cantonised. But all that is far off, as warring factions continue to tear each other and the country apart. Assad has demonstrated there are almost no limits beyond which he will go to defend his regime. From Canberra’s perspective, these are testing moments in a broader chess game as Australian policymakers seek to make sense of a Trump foreign policy not only towards Syria and the wider Middle East, but in a confrontational US stance towards North Korea. It is much too soon to begin talking about a Trump Doctrine, but whatever was said on the campaign trail by an “America First” candidate intent on avoiding foreign entanglements that position now seems to be fungible. Based on Trump’s actions in Syria and his threats against Pyongyang, backed up by the deployment of an American battle group, what is emerging is an apparent willingness to use force, or at least employ the threat of force overtly to advance US foreign policy interests. How then should an Australian government respond to what is shaping as a significant departure from business as usual under a restrained Barack Obama administration, whose preferred approach was to use drone strikes and other such methods to assert American foreign policy interests more subtly? Australian policymakers would be advised to proceed with extreme caution. Turnbull and his advisers should be especially wary of any moves that would involve Australia more deeply in Middle East conflict. Australian military forces are in the region to help the Iraqi government stabilise Iraq, not become enmeshed in a vicious civil war in Syria beyond limited air strikes against Islamic State strongholds in central and eastern Syria. Turnbull and his national security team need to be mindful of the risks involved in any sort of deeper engagement, including especially the commitment of ground troops. Syria is a mess, and a treacherous one. What remain unclear is whether the Trump missile attack was a one-off strike aimed at sending a message to Assad not to resort to chemical weapons again, or whether it will be followed by other such actions. At this stage, it seems to be of a piece with missile strikes that Bill Clinton launched against Iraq, Afghanistan and Sudan when those countries crossed a line, in Washington’s view. But you can’t be sure. What is the case is that Trump’s warning shot has got Moscow’s attention. As things stood, Vladimir Putin more or less had his way in Syria in a loose alliance with Iran and its proxy, Hezbollah, in support of the toxic Assad regime. Now, Moscow has been put on notice. There are limits to Western tolerance of Assad’s war against his own people, in which more than 400,000 have died and half the country’s population of 22 million displaced. This brutal campaign has involved the widespread use of barrel bombs and other such cluster devices that inflict carnage on those in the vicinity. These devices have been used mercilessly, and have drawn the condemnation of governments and human rights organisations under various Geneva conventions. Putin may be willing to put pressure on Assad to forego the use of chemical weapons again, but it is hardly likely he would abandon him, or his regime. Russia has too much invested in Syria, including an agreement on Mediterranean berthing rights for its navy, use of airstrips and other such facilities, and perhaps most important the message Russian involvement delivers to the rest of the Middle East. Russia is back four decades after it was bundled out of Egypt by President Anwar Sadat, and is not about to withdraw. What vastly complicates Western policy in Syria is how to sanction Assad on one hand and deal with Islamic State on the other, without the country unravelling completely, thus enabling a jihadist takeover. Western policymakers tell us the aim is to “defeat’’ IS, but what does this mean? IS might be pushed out of Mosul in northern Iraq and its stronghold in Raqqa, but it will not be “defeated’’ in any formal sense. There will be no armistice agreement in which both sides negotiate a truce. Whether we like it or not IS, or whatever its mutations, will remain a threat to regional peace and stability, and further afield a continuing terrorist menace across the globe. What we have on our hands is a generational struggle. This is all the more reason to hasten slowly in Syria outside an internationally-backed settlement involving the US and Russia that would end the bloodshed. This would represent the best case outcome, but how to fashion such an arrangement given Moscow’s resolute support for Assad is the question. A bloodstained Assad or his immediate henchmen should not be part of these transitional arrangements. Their place is before a war crimes tribunal at The Hague. The future of Syrian President Bashar al-Assad’s reign lies with Vladimir Putin’s obstinacy and ability to withstand US pressure. The devastating gas attack in Syria, attributed to the Assad regime, and the swift US missile response is a game-changer for all parties involved in the Syrian conflict. This is a complex war, but it helps to look at the key players in three interlocking layers. In the first layer are the local players within Syria. Since the 2011 Arab spring uprisings, all local players wanted to get rid of the 17-year-old regime of Syrian President Bashir Al-Assad. He desperately tried to cling to power and proved surprisingly resilient under immense political and military pressure. 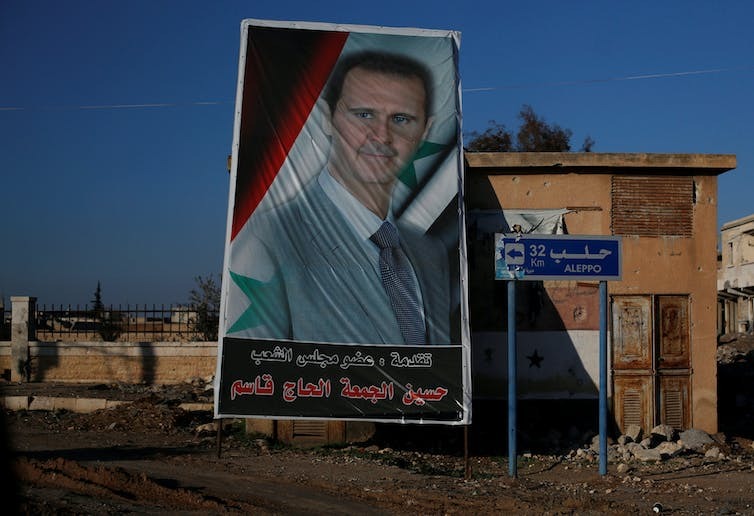 Assad’s strength comes from Russian, Chinese and Iranian support – as well as support from the large portion of secular Arab Syrians and religious minorities (Alawites, Assyrian Christians and Druze). Initially, there were three main insurgent groups opposing Assad. The first was the moderate Islamic coalition made up of Sunni Syrian elite who established the Free Syrian Army (FSA), made up of officers who had defected from the Assad forces. The FSA’s initial promise soon gave way to pessimism, as it could not deliver a decisive blow against Assad. Second, Kurds in northern Syria organised themselves as the YPG (a militia group whose name translates to “People’s Protection Units”) and established the Syrian Democratic Forces (SDF). They received widespread acclaim and support, particularly from the US and other Western nations, for their strong defence against Islamic State (IS) forces. Third are the Salafist jihadist groups such as the al-Nusra Front, which changed their name to the Front for the Conquest of the Levant, and claimed independence from al-Qaeda. It was these jihadist groups that led the chief military opposition to the Assad regime for the last six years, including in Aleppo until its fall in 2016. IS emerged as a key political and military force in Syria in 2014. Unlike other insurgent groups, it did not fight Assad. Rather, it opportunistically claimed large swathes of uncontrolled land and declared an independent caliphate state, becoming the chief source of radicalism threatening Western societies. The second layer in the Syrian conflict is occupied by regional powers such as Turkey, Iran and Saudi Arabia. Iran has been a longstanding ally of the Assad regime because of its sectarian, political and economic interests. Assad and his entourage are Alawites, an off-shoot of Shia Islam. Syria is an important corridor for Iran to press its influence over Lebanon’s Shi’ite Hezbollah and provide access to the Mediterranean. Iran’s regional ambitions require the continuation of the Assad regime. Worried about Iran’s growing influence in the region, Saudi Arabia and Qatar have supported the Salafist insurgent groups. Fearing the spread of IS ideology and popularity in its realm, the Saudi government has supported US-led air strikes on IS since 2014. Turkey has been the most active regional player in the Syrian conflict. Turkish President Recep Tayyip Erdogan has supported all Sunni insurgent groups with weapons, training and logistics since the beginning of the conflict, with the exception of the Kurdish YPG. Turkey fears that an independent Kurdish region in Syria (combined with Kurdish northern Iraq) would encourage its Kurdish population to also seek separation. Erdogan pushed the Turkish army into Syria in August 2016. Although he desperately wanted to become involved in the impending US-backed offensive on the IS capital of Raqqa, he was left out of the US plans. The third layer of the Syrian conflict is occupied by Russia and the US. They are major geopolitical players whose conflicting interests over Syria are the source of the current impasse, and the reason why removing Assad has become exceedingly difficult. Unhappy with the increasing US and Western influence in the Middle East, Russian President Vladimir Putin saw an opportunity to expand his economic and military interests in the Syrian conflict, and staged a challenge to the geopolitical world order. In the course of the Syrian civil war, Putin has become the custodian of the Shi’ite alliance between Iran, Syria and Shi’ite political forces in Iraq and Lebanon. Deep down, Russia fears a destabilised Syria falling under IS control would mobilise radical Muslim groups within its borders. Under the Obama administration, the US consistently stayed out of direct involvement in the Syrian conflict. Busy with the Iraq exit, Barack Obama missed the window of diplomatic opportunity in the crucial early months of the Syrian uprising. When violence started, Obama elected to provide limited military support to YPG and FSA, hoping they could muster enough opposition to dismantle Assad. Obama admitted his strategy failed as the “US was muscled out of Syria” by an increasingly bold Putin. His support allowed Assad to gain the upper hand in Syria with the fall of Aleppo in December 2016. This is why it was bizarre that Assad would launch a gas attack at this crucial juncture. He had nothing to gain and everything to lose. Assad vehemently denied the use of chemical weapons, while Russia claimed the Syrian air strike hit a rebel chemical munition depot. The reason is now irrelevant, as the swift US missile attack has sealed the issue. US President Donald Trump served notice not only to Assad and Russia, but all the players in the conflict. Even though Russia and Iran responded with no-crossing-red-line tough talk, the missile attack opens a large ground for a US-led offensive on the key IS stronghold of Raqqa. The US intends to use this space to eliminate IS and dismantle the Assad regime. However, this is not likely anytime soon. Western powers suffer from a dissidence – they would like Assad to go, but cannot see a viable alternative. With his secular outlook and promise of protecting religious minorities, Assad still wields much support. Trump’s impulsive nature is the US’s greatest weakness in world diplomacy, but counter-intuitively, is its greatest strength in a conflict like Syria. The impulsive courage of Trump, coupled with the military prudence of the Pentagon, gives the US the best advantage in the region and disturbs the Assad, Iran and Russian alliance. They can no longer act with impunity, knowing Trump would have no qualms about hitting Syrian regime targets, which were untouched by the Obama administration. Trump has tasted the rush of being commander-in-chief. He is likely to follow with other bold military steps, and insist on the demise of the Assad regime. Assad’s future lies with Putin’s obstinacy and ability to withstand US pressure. As the FBI investigation into the Trump election campaign’s Russian links deepens, Trump is likely to use Assad card to deflect attention and prove his disassociation with Russia. Betting all his money on Assad, Putin will use the Syrian leader as a bargaining chip to press Trump to accept a place for Assad in the post-IS Syria, at least in the Western part of the wrecked country. This could save Assad’s skin, but at the expense of Syria remaining a divided country. The YPG will emerge as the main winner securing an autonomous polity in northern Syria in exchange for its help in the US-led Raqqa military offensive, driving another wedge toward the eventual division of Syria. It will follow the trajectory of the northern Iraq Kurdish region, with the prospect of future independence. Sunni insurgent groups are likely to be the biggest losers. They may have to contend with the remaining remote regions while Syria harbours the propensity to be another Iraq and a breeding ground for IS-inspired radicalism threatening societies the world over.